Daido presents D.I.D New Tech roller chain, designed specifically for the demanding drive train applications of our customers. 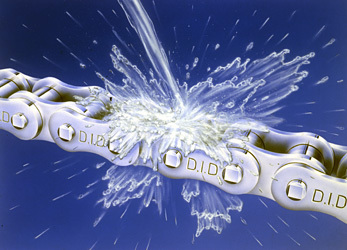 Each of the four series of D.I.D New Tech Chain offers superior solutions for the most technically advanced supplier of roller chain products in the world, Daido Corporation. For applications where extra strength, shock load and fatigue resistance is required. For applications subjected to contaminants or a lack of lubricants. For applications subjected to environmental extremes. For more comfort and worker friendly chain conveyor and drive applications. 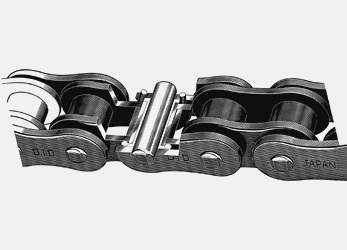 KS type roller chains are enhanced in fatigue strength and shock strength without changing the dimension in the pin length direction of standard roller chains. Plates are enlarged, and the machining accuracy and assembling accuracy of components are improved. The roller chains hold high transmission efficiency for applications from low to high speeds and are powerful enough to withstand long-term use. HK type roller chains conform to H type of ANSI, and their inner and outer plates are equal in thickness to those of the next larger size of standard roller chain. Therefore, the tensile strength is higher by approximately 20% and the maximum allowable load is higher by approximately 15% compared to D.I.D ANSI standard roller chain. However, since the weight of the chain is also larger, the performance at high speed declines. So, HK type roller chains are suitable for heavy duty at low speed. The DID HKS series roller chain have thicker link plates than KS type roller chain, and are the highest in tensile strength and allowable load among general application chains. Thus being suitable for low speed heavy duty transmission. The HKS roller chains are 20 percent higher in tensile strength and 50 percent higher in maximum allowable load than the standard roller chain, but since they are also higher in weight, they are lower in performance at high speed. So, they are suitable for heavy duty at low speed. Daido's "D" AND "T" Series roller chain is manufactured with a cold forged bushing and is lubricated with a Daido patented V-Grease. This lubricant extends the wear life up to 4 times longer than conventional ANSI standard roller chain. This patented V-Grease adheres to the chain in high revolution applications and resists being washed away in outdoor usage. Daido's D & T Series chain is one of the lowest cost upgrades available for your roller chain requirements. Perfect lubrication extends the life of the chain. However, it is not easy to avoid lubricating oil that is deteriorated by the oxidation of the lubricating oil itself, penetration of wear residue and dust, etc. In such situations, the DHA chain is recommended. Even in such severe environments where hard and fine particles are evident without any lubricating oil at all, the DHA chain shows excellent performance. DID O-ring chain is dramatically improved in durability, since grease is sealed between the pins and bushings by O-rings. O-ring chain is recommended for applications which provide abrasive conditions require frequent maintenance or where sintered bushing roller chain is not applicable due to its insufficient shock load capacity or high speed capacity. DID UR roller chain has bushings made of a sintered alloy which is impregnated with lubricating oil during manufacture. The sintered bushing roller chain is maintenance -free chain suitable for applications where lubrication is not permitted. In appearance sensitive applications, a rustless (URN) is recommended. In applications, limit the traveling speed 492 ft/min. or less. For a dusty environment, the use of an O-ring chain is recommended. URF is the heat resistant version of UR chain which is applicable up to 400°F. The wear life at 400°F is two times as long as the regular UR chain. DID Stainless Steel chain is available either as an SS chain with all of the components made of austenitic steel (SUS304, 18-8 stainless steel) or an SSK chain with pins, bushings and rollers made of quench-hardened stainless steel (SUS631) and with plates made of austenitic stainless steel (SUS304). An SS chain is the highest in corrosion resistance and heat resistance, and can be used in all chemical plants, food processing machines, water treatment machines, etc. However, since it is made of austenitic stainless steel, its tensile strength is less than 70 percent that of a standard roller chain. Furthermore, the maximum allowable tension is as low as 10 percent of standard roller chain. Therefore, these factors must be carefully examined when you select SS chain. SSK chain is 1.5 times higher than SS chain in maximum allowable load. This is accomplished by improving the strengths of pins, bushings and rollers. Both SS & SSK are comparable in corrosion resistance. Stainless Steel X-Ring chain (SSLT) with chemical resistant X-Ring and FDA/USDA approved lubricant is also available for up to 10 times longer wear life. 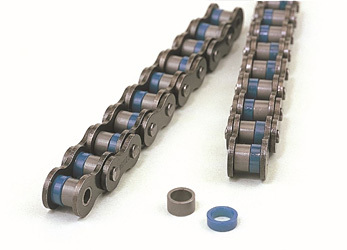 Standard roller chain is likely to become brittle at low temperature and must be used at higher than 14°F. TK chain is unlikely to suffer from low temperature brittleness. TK chain can be used down to - 40°F by setting the maximum allowable load. The lubricating oil applied on the chain is a special low temperature oil. Double Guard Chain (WE) has DID's unique two different coatings applied before assembly on the ANSI standard chain. It achieves approximately two times higher anti-corrosion performance than a Hi-Guard Chain in a salt water spray test. 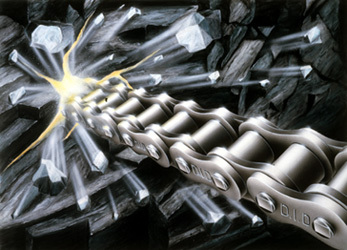 This chain also withstands light alkali and an acidic atmosphere and the best alternative of Stainless Steel Chain. The strength is the same as Hi-Guard Chain. Hi-Guard chain is second in corrosion resistance performance, next to a stainless steel chain. A luster-less white protective film is formed on the surface of the chain by a special baking process. The Hi-Guard chain has excellent galvanic corrosion resistance and rust resistance. Since the film is heat-resistant up to 482 0F, it protects the chain even in high temperature. The Hi-Guard chain has slightly lower tensile strength than standard chain, but it is equivalent in maximum allowable load and wear resistance. Stainless steel chain is lower in strength and wear resistance. For this reason, when sufficient corrosion resistance is required without sacrificing strength, Hi-Guard chain is recommended. Since the Hi-Guard film works as a sacrificial anode for the base chain, sufficient corrosion resistance can be expected even if the film peels. A "two piece roller structure" achieves a significant noise reduction effect. When the chain is engaged with a sprocket, the audible shock is reduced by the elastic deformation of rollers, made of special elastomer, achieving a silencing effect as much as 10 DB. When the chain is used for conveying, the sliding noise between the rails and the rollers is effectively reduced. Available sizes are RC40SLN to 80SLN.